Tommy Amaker, the highly regarded coach of the Harvard men’s basketball team, is without his two best players this year. They were involved in a cheating scandal (photo credit: Richard Howe). Tommy Amaker, the highly regarded head coach of the men’s Harvard basketball team, has made no mention to the press about the two key players missing from this year’s roster. Those two key players — Kyle Casey (the leading scorer) and Brandyn Curry (the ball-handler who runs the point) — have withdrawn from the university after the recent Harvard cheating scandal. In fact, Amaker never even stated for the record that these two young men had withdrawn. Rather, he only spoke of the players he has available to take the court this coming season. This has got to be tough for Amaker as he’s lost his two best players from a team that claimed its first outright Ivy League title last season and its first appearance in March Madness (in the NCAA Tournament). 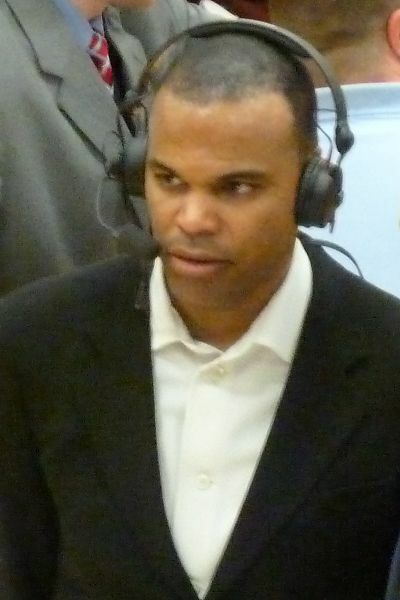 Amaker’s five years at the helm of the Harvard men’s basketball team have been the most successful in the university’s long history. And Harvard was predicted to win the Ivy League crown again this year — before its two best players got into trouble with the university’s honor code. We’re glad to see that the university’s two best basketball players weren’t immune to the fallout from the cheating scandal. It’s good to know that Harvard stands by its honor code and applies it to each and every one of its students — no matter how this impacts the school’s basketball program. And make no mistake — in terms of wins and losses, this will negatively impact the school’s basketball team. But maybe, just maybe, players will think twice next time they consider cheating in a class. One can only hope.